Light-painting can make for some really interesting photos, and it’s pretty simple if you set up your shots properly. While in Alaska with the Alpha Imaging Collective, I made this image with the assistance of Jody from Alaska Photo Treks. While you can do it on your own, light-painting is much easier when you have some help. You’ll need a tripod to keep your camera steady because you’ll be leaving the shutter open for about a 15-second exposure. You may have to play around with the shutter speed, aperture and ISO depending on the amount of ambient light, and the amount of light-painting you’re capturing. Also, it helps if you set the shutter to go off on via timer or use a remote trigger, to help keep the camera steady. Photo by Noah Greer (@vaderbreath). Sony α9. Sony 16-35mm f/2.8 G Master lens at 19mm. 15-seconds, f/2.8, ISO 1000. 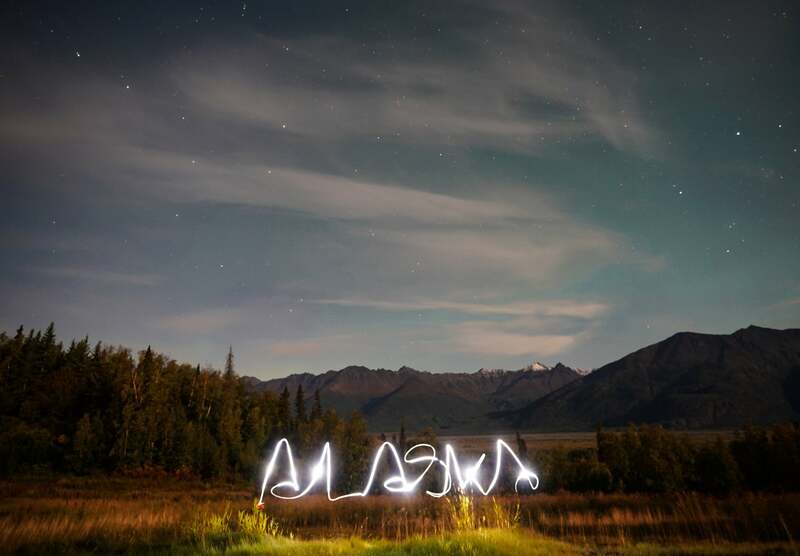 We were in Alaska on the first night of our Sony Alpha Collective trip, waiting for the Northern Lights to appear, so we decided to do a little light painting, while the auroras developed. Jody from Alaska Photo Treks was facing me with her flashlight pointed toward the camera so she had to write ‘Alaska’ backwards, for it to appear properly in the photo. For this particular photo, I mounted the new Sony α9 and the 16-35mm f/2.8 G Master lens to my tripod, and I set the ISO at 1000. The shutter speed was 15-seconds, f/2.8, and a focal length of 19mm. You can experiment with your settings to get different results of course, but this is a good general place to start for light-painting shots. I found the α9 does very well in the dark. It focuses well and the G Master lens is a beauty as well. I framed the shot where Jody would be light painting. It’s important to find your focus before you execute the shot. I used the camera’s timer so I wouldn’t shake it when pressing the shutter button. And in a situation like this where I'm spelling out a word, the person with the flashlight has to be able to write it backwards. It can take a couple of tries to get it right, but it's worth it. Noah Greer is part of the Alpha Imaging Collective. Follow him on Instagram @vaderbreath. Noah Greer is a member of the Sony Alpha Imaging Collective. Follow all of their adventures on Instagram https://www.instagram.com/vaderbreath/. Is This The Dream Setup For Wildlife?